Breville have long been a name in Australian households, with a history that spans way back to the 1930s…when Bill O'Brien and Harry Norville (whose names together created the Breville brand) made radios and mine detectors for the war. But mine detectors weren’t the be all and end all of Breville. When television transmission began in Australia, Breville turned their attention to small home appliances, and the company as we know it today was born. How do you trap flavour or drain fat using the same grill? With The AdjustaGrill & Press, of course!. With a powerful 2200 watt heating element, this handy kitchen gadget allows you to cook eggs, pancakes and sandwiches with ease. The feet on this grill are adjustable – simply move the feet forwards to grill flat and let your meals simmer in their juices, or you can adjust the feet back to angle the grill and drain away unwanted fat and grease. With variable temperature controls, a floating hinged top grill plate and adjustable height controls, The AdjustaGrill & Press really can do it all! Heavy duty die-cast arm for strength and durability. Versatile flat bottom plate and ribbed top plate – perfect for grilling, toasted sandwiches, eggs and pancakes. Floating hinged top plate automatically adjusts to maintain even pressure on both thin and thick foods. Adjustable tilt – move feet forwards to grill flat or adjust feet back to angle the grill plate, allowing you to drain away unwanted fat and grease. 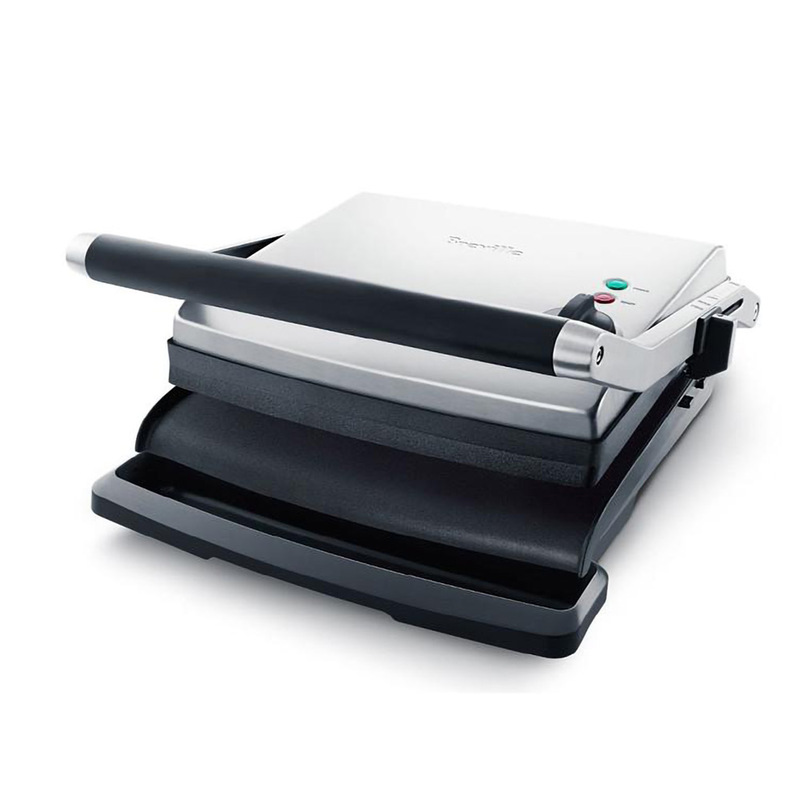 Seven adjustable height control settings – ideal for open sandwich melts and delicate meals. Intergrated ‘Power’ and ‘Ready’ lights lets you know when the grill is heating or ready to use. Box Dimensions: 41cm (l) x 39.5cm (h) x 17.5cm (w).